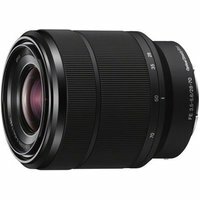 The Sony E28-70mm f3.5-5.6 OSS FE lens is built for Sony's full-frame E-mount compact system cameras, such as the alpha a7 and a7R, but will also work with Sony's APS-C range. From family portraits to landscapes, the E28-70mm with Optical SteadyShot (OSS) is a versatile, everyday lens for blur-free shooting throughout the zoom range. The lens is equipped with three aspherical elements and one ED glass element for minimal aberration and beautiful contrast. The travel friendly design is enhanced further by dust and moisture resistant seals.